Start with the freshest eggs possible, ideally purchased from a local egg producer. Beat the eggs well and add seasoning (salt, pepper, chopped herbs) as desired. There has been much debate over the years whether to add liquid, either water or milk, to the beaten eggs. Although the addition of water creates a fluffier omelette, it dilutes the flavour of the egg. Adding whole milk or cream produces a heavier, denser omelette. Neither way is right or wrong, it is a matter of preference only. Heat a non-stick pan on the stove to medium or medium-high heat. The right pan temperature is crucial. The pan should be hot enough to cook the eggs quickly, but not smoke. Add a pat of butter to the pan and swirl to melt. Do not let the butter burn. Add the eggs. Using a wooden spoon or non-stick utensil, stir them quickly in a circular motion and, at the same time, pull the handle of the pan in towards you and then push it out and away, all the while, keeping the pan on the burner (see step-by-step photos). 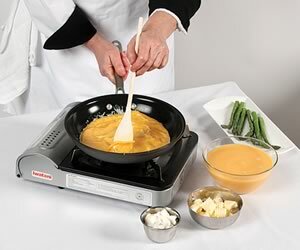 This rapid movement ensures evenly cooked eggs and prevents them from sticking to the pan. Once the eggs are cooked to your liking, turn the pan handle to 90 degrees. Tilt the pan and lightly ease the egg towards the lower side of the pan using the spoon. A filling may be added at this stage, if desired. For this omelette I have added lightly blanched asparagus and soft goat cheese. Now fold the upper third of the omelette over the filling (if using). Grasp the handle of the pan underhanded (palm up). Hold a serving plate with your other hand and flip the finished omelette, folding it over as you do, onto the plate. The resulting omelette should be pale in colour, have a smooth surface and be oblong, or cigar shaped. Your first attempts at this type of omelette may not be perfect, but be forgiving and try not to focus on the end result. It also helps to have a few hungry participants on the receiving end. Continue to practise the technique, adjusting the burner temperature as you go. Then, after a few trial omelettes, shift your attention to the look of the finished product. Creating this style of omelette may seem daunting at first, but as I discovered as an apprentice so long ago, learning this skill is much like riding a bicycle, master it once and the skill will last a lifetime. Some form of the omelette has been around practically since humans first learned to crack an egg.